Kenneth Inniss, 56, has not voted in a U.S. election since 1984, when he first went to prison for a felony conviction. He is now out but will have to wait one more year until he is off parole to vote. "It's a right that we take for granted until it's taken from us," he said. "And that's when it really hit home for me. I don't have a say in how those laws are keeping me incarcerated." Inniss recently packed into a glossy black van with eight other formerly incarcerated New Yorkers and embarked on a road trip to Cleveland, Ohio. The group had a simple mission: Inform Ohio ex-prisoners of their right to vote. In Ohio, a key swing state in the upcoming presidential election, former felons can vote as soon as they are released from prison. They don't have to wait until they are off parole, a post-release period during which former inmates are monitored for good behavior. Emblazoned on the vehicle's side, in blue — beneath a logo of a dove escaping bars — was a slogan: "Building people, not prisons." "I can't vote, so let me try to encourage at least five other people — family members and friends — by talking about political issues and how they affect us. And why you should vote," Inniss said. The Sentencing Project, a group working to promote a fair criminal justice system, says 6 million Americans are denied the right to vote in the upcoming election because of felony convictions. Felonies are serious crimes, often violent and punished with prison sentences of more than one year. New York and most other states do not allow felons to vote until they have completed parole and, in most cases, an additional period of probation. Twelve other states deny voting rights to some or all released felons permanently. Only two U.S. states — Maine and Vermont — extend voting rights to convicted felons even while they are in prison. But then there are cases like Ohio, where persons with felony convictions cannot vote while incarcerated but automatically regain the right upon release. But many of those affected are unaware of this. For Inniss and his fellow parolees, this has presented a unique opportunity to effect change in a critical battleground state this election season and empower others, regardless of their own ability to vote. JoAnne Page, president and chief executive officer of The Fortune Society — an advocacy organization that fosters prisoners' re-entry into communities — led the group of formerly incarcerated New Yorkers on the trip to Cleveland. "Our folks are saying, 'I'm on parole; I can't vote.' You can vote, and it's really important that you do so," said Page. "If you're not willing to follow the law, then you can't demand a right to make the law for everyone else," said Roger Clegg, president of the Center for Equal Opportunity, a conservative think tank. He favors a policy that determines re-enfranchisement on a case-by-case basis. "It can't be assumed that a felon has turned over a new leaf the day that he walks out of prison," Clegg said. "Recidivism rates are very high in this country, so it makes sense to wait some period of time to make sure that the individual really has turned over a new leaf." But the Fortune Society makes a connection between reduced criminal relapse and increased civic engagement. "We have 5 percent of the world's population, 25 percent of the world's prisoners. What's really important is that we build a constituency for changing that," Page said. "People who have lived through the experience of incarceration and people whose loved ones have been incarcerated know how much damage it does." But the issue of felons voting is heavily politicized. In August, Republican presidential nominee Donald Trump weighed in on Virginia Governor Terry McAuliffe's attempts to change his state's voting laws to allow 200,000 formerly incarcerated adults to vote. Virginia is one of the states that prohibit convicted felons from voting even after release and parole. "Hillary Clinton is banking on her friend Terry McAuliffe on getting thousands of violent felons to the voting booths in effort to cancel out the votes of both law enforcement and crime victims," Trump told a Fredericksburg, Virginia, crowd. "They are letting people vote in your Virginia election that should not be allowed to vote." The state Supreme Court overturned McAuliffe's executive order, ruling that a restoration of rights could be granted only on a case-by-case basis. 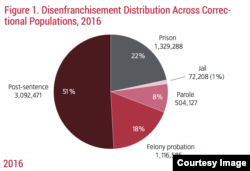 In Virginia and across battleground states, opponents of changes in voting-rights laws have argued that re-enfranchisement during an election year is a political tool that would benefit Democrats, because of the high proportion of minorities in prisons across the nation whose priorities tend to fall in line with a more progressive agenda. This was the second trip the Fortune Society has taken in an election year. The first was in 2004, following the Bush-Gore 2000 election that was determined by several hundred votes in Florida and a Supreme Court decision. One ex-prisoner on the trip was Barry Campbell, 50, who grew up addicted to drugs and landed in Rikers Island — New York's infamous jail complex on the East River — following a robbery charge in 1991. He eventually became eligible to vote in 1997 and has not missed an election since. But there are still those people, he said, who look at him as a convicted felon today. "That's something I did; that's not who I am," Campbell said. "If people just get a chance to know who I am, they will be more than willing to let me in their society." "A lot of us out here that can't vote honestly feel in our heart we are just existing and not truly living. Yeah, you can get up and brush your teeth and all that, but you're not truly living unless you're in the main artery of life, by having the ability to vote."